The All Progressives Congress (APC) says Senate President Bukola Saraki is so selfish with his political ambitions. "The only politics that Bukola Saraki plays is self, himself only and only himself. The interest and welfare of the people of Nigeria do not mean anything to him. 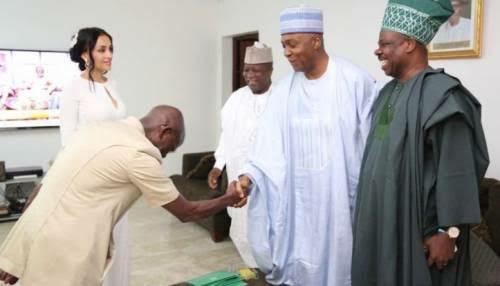 Now it is the Presidency Saraki wants. And we ask with what antecedents is he doing this? Conspiracy, blackmail, treachery and vaulting ambition which overleaps itself and falls on the other, as rightly captured by William Shakespeare. Bukola Saraki will rather rule in hell than serve in paradise." Outlining a list of corruption allegations levelled against him, the party urged Nigerians to be wary of Saraki, describing him as a man "whose personal ambition will always supersede the interest of the majority and national interest". In a statement by Yekini Nabena, its Acting National Publicity Secretary, the APC blamed the Senate President for refusing to reconvene the National Assembly, an action it said could "sabotage INEC’s ability to conduct free, fair, transparent and credible elections in 2019". The statement read: "Nigerians should be wary of a man whose personal ambition will always supersede the interest of the majority and national interest as currently displayed in the National Assembly. While Saraki refuses to reconvene the National Assembly, the 2019 election budget of the Independent National Electoral Commission (INEC) is dangerously delayed, an action deliberately taken to sabotage INEC’s ability to conduct free, fair, transparent and credible elections in 2019. "While Saraki refuses to step down as Senate President as rightly and severally demanded by the APC-dominated Senate, he is bent on foisting a PDP-minority rule (Senate President and Deputy Senate President) in the Upper Legislative House. Restating its earlier position on its call to anti-graft agencies to "check the use of stolen public funds to finance elections in this country," the party also emphasised that the "Nigerian electorate must have the opportunity to choose from candidates that can pass the integrity and anti-corruption test." The APC called on Nigerians to exercise their voting rights in the 2019 elections to ensure that they "never again entrust the leadership of this great country to thieves, whose sole aim is treasury looting and returning us to the dark ages where impunity and institutionalised corruption was the order of the day."